Errors are detected for code blocks including information words arranged in a predetermined order and a number of check words. At least one type of flag representing decoding status is then added. Errors for additional code blocks including words arranged in a second order are detected. S word errors and E word that 2S+E is less than or equal to d-1 are corrected where S is the number of errors at ankown locations and d is the Hamming distance between the information and check words. Error locations and patterns are determined for a number of S and E combinations which are selected having high correction capability and low miscorrection probability. 제1도는 이중 부호화된 에러 정정 코드의 데이타 배열을 나타낸 도면. A first diagram showing the data arrangement of an error correction code encoding a double turn. 제2도는 C 1 복호화의 순서도. The second turning of the flow chart C 1 decoding. 제3도는 C 복호화의 1예의 순서도. The third turning first example flow diagram of a decoding C.
제4도와 제5도는 4개의 플래그를 갖는 C 2 블럭을 위한 에러 패턴을 나타낸 도면. The fourth assist a fifth diagram showing an error pattern for the block C 2 having four turns flag. 제6도는 본 발명의 C 2 복호화의 순서도. A sixth flow chart of turning C 2 decoding of the present invention. 제7도와 제8도는 C 2 블럭에 대한 잘못 정정 및 정정 불능정정에러 패턴을 나타낸 도면. Seventh help eighth view showing the error correction and the uncorrectable error correction pattern for the block C 2 degrees. 제9도는 제6도의 상세도. Ninth degree sixth details turn Fig. 제10도는 본 발명의 또 다른 실시예에 대한 순서도. Claim 10 turns a flow chart of yet another embodiment of the present invention. 제11도는 제10도의 방법을 실현하기 위한 장치의 1실시예의 블럭도. The Figure 1 embodiment block diagram of an apparatus for realizing the method of claim 10 degree turn 11. 제12도는 이중 부호화된 에러 정정 코드의 또 다른 예이다. Claim 12 is another example of an error correction code encoding double-turn. 제13도는 본 발명이 제12도의 코드에 적용될 때의 C 2 복호화의 순서도. Claim 13 degrees C 2 flow chart of the decoding at the time the invention is applied to a separate code of claim 12. 제14도는 본 발명의 에러 정정 회로의 1실시예의 블럭도. 14 degrees is also the first embodiment of a block error correction circuit of the present invention. 제15도는 DAD에 적용된 본 발명의 실시예에 대한 순서도. Claim 15 degrees flow chart of an embodiment of the present invention is applied to the DAD. 제16도는 제15도를 상세히 나타낸 순서도. Claim 16 degrees flowchart showing a detail in Figure 15. 제17도는 제15도와 제16도의 실시예의 에러 검출 능력과 에러 정정 능력에 대한 종래의 장치와 비교한 장치의 비교 특성 곡선을 나타낸 도면. 17 degrees view showing a comparative characteristic curve of the device compared with a conventional device for the first 15 degrees and 16 degrees embodiment of an error detection capability and the error correction capability. 이 출원은 오가모도 히로오, 고바야시 마사하루, 니시무라겐조, 노꾸찌 다가하루, 아라이 다가오, 시부야 도시후미의 "에러 정정 방법 및 장치"라는 명칭으로 1984년 6월 22일에 출원된 미국 특허 출원번호 No. This application organosilane modo, ongjin Hiroo, Kobayashi, Masaharu, Nishimura Kenzo, no kkujji polyhydric day, Arai comes along, Shibuya shown tail "error correction method and apparatus," U.S. Patent Application Serial No., filed on June 22, 1984, that Name No . 622,711에 관하여 이는 1983년 6월 22일에 제출된 No. About 622,711 submitted on June 22, 1983 No. 110931/83과 1983년 6월 20일에 출원된 No. 110931/83 filed on 20 June 1983 and No. 130839/83과 1983년 11월 11일에 출원된 No. Filed 130839/83 and No. 11 November 1983 210858/83인 일본 특허출원에 기초를 두고 있으며, 본 출원에 참조로 하여 통합시킨 것이다. Japan 210858/83, and based on a patent application, which is integrated with reference to this application. 본 발명은 디지탈 신호 재생에서의 에러 정정, 특히 이중 부호화 리드 솔로몬(Reed Solomon)코드와 같은 에러정정 코드의 복호화에 적합한 에러 정정 방법 및 장치에 관한 것이다. The present invention relates to an error correction method and apparatus suitable for the decoding of the error correction code, such as error correction, in particular a double Reed-Solomon coding (Reed Solomon) code of the digital signal reproduction. 디지탈 신호를 전송하는 많은 경우에, 검사워드는 송신국에서 붙여지고, 전송될 데이타의 에러는 전송계에서 발생된 데이타 에러를 정정하기 위해 검사워드를 써서 수신국에서 검출, 정정된다. In many cases of transmitting a digital signal, check words are put in the transmitting station, an error of the data to be transmitted is detected, the correction at the receiving station by writing the check word to correct the data error generated in a transmission system. 대부분의 경우, 효율적이며, 복호화하기 쉬운 BCH코드중의 하나인 리드 솔로몬 코드가 검사워드로서 사용된다. In most cases, efficient, and is one of a Reed-Solomon code in the easy BCH code decoding is used as the test word. 이중 부호화 리드 솔로몬 코드는 에러 정정 능력이 높고, 디지탈 오디오 디스크(DAD)와 PCM 녹음기에서 사용된다. Dual encoding Reed-Solomon code has a high error correcting capability, is used in a digital audio disk (DAD) and the PCM recorder. 제1도는 이중 부호화 리드 솔로몬 코드의 1예이다. The first is the example of a double-encoding Reed-Solomon code to turn. (1)은 정보워드, (2)는 제1의 검사워드, (3)은 제2의 검사워드이다. (1) information word, and (2) the test word, and (3) of the first check is a word of a second. 부호화에서는 제1의 검사워드 Q 0 , Q 1 , Q 2 , Q 3 가 12개의 정보워드 W 0 -W 11 에 부가된다. The coding is in addition to the first check word Q 0, Q 1, Q 2 , Q 3 are 12 information words W 0 -W 11 of the. 12개의 정보워드와 4개의 제1의 검사워드로 구성된 블럭을 C 2 블럭(5)라고 한다. 12 information words with four words of the block consisting of test 1 and C 2 as a block (5). C 2 블럭(5)의 워드들은 제1도에 도시한 배열 사이에 끼워진다. Word of C 2 blocks (5) are fitted between the first arrangement shown in Fig. 제2의 검사워드 P 0 와 P 1 이 C 2 블럭(5)의 정보워드 W 0 -W 11 와 제1의 검사워드 Q 0 , Q 1 , Q 2 , Q 3 에 부가된다. The first check word P 0 and P 1 of the two is added to the check word Q 0, Q 1, Q 2 , Q 3 of the information of the block C 2 5 words W 0 -W 11 as a first. 12개의 정보워드와 제1의 4개의 검사워드, 제2의 2개의 검사워드로 구성된 블럭을 C 1 블럭이라고 한다. 12 and the block information words consisting of four check words, the two check words in a second of the first block is referred to as C 1. 복호화에서는, C 1 블럭에 대한 에러 검출과 정정을 하여 복호화 신호가 빼내어지고, C 2 블럭에 대한 에러 검출과 정정을 하여 이 복호화된 신호가 출력된다. In the decoding, the decoded signal is taken out by the error detection and correction for the block C 1, the signal is decoded by the error detection and correction for the block C 2 is output. 이중 부호화 장치에서는, 두 개의 다른 코드 블럭(C 1 과C 2 )에 대해 2번 이상 복호화 함으로써 정정 능력이 향상된다. In a dual-encoding apparatus, the correction capability is improved by decoding more than once, for two different code block (C 1 and C 2). 이와같은 이러 정정 장치는 1984년 3월 13일에 사코(Sako)에 의하여 미국 특허 4,437,185로 등록되었다(영국 특허 GB 2079993A). In these devices, such correction has been registered with the United States Patent 4,437,185, by Sako (Sako) on March 13, 1984 (British Patent GB 2079993A). 그러나 위와같은 복화호 장치에서는, 단지 하나 또는 두 단어만이 정정되며, 그 코드의 고유의 정정 능력이 충분히 사용되지 않았다. However, in the above decryption device, such as call, only one or two words is the only correct, this unique correction capability of the code was not fully used. 에러 검출 플래그가 두번째 복호화에서 충분히 사용되지 않았기 때문에, 그 코드의 정정이 감소된다. Since the error detection flag has not been fully used at the second decoding, the correction of the code is reduced. 본 발명의 목적은 이중 부호화된 에러 정정 코드의 고유의 에러 검출 및 정정 능력을 충분히 활용할 수 있는 에러 정정 방법 및 장치를 마련하는데 있다. An object of the present invention to provide a error correction method and apparatus which can make full use of error detection and correction capabilities of a specific error correction code, a double encoding. 본 발명의 한 결해에 의하면, 에러의 수는 이중 부호화된 에러 정정 부호의 제2복호화에서 검출되고, 소실과 에러 정정은 검출 결과에 따라 잘못 정정할 확률이 작을 때에만 영향을 받는 에러 정정 방법 및 장치를 마련하는 것이다. 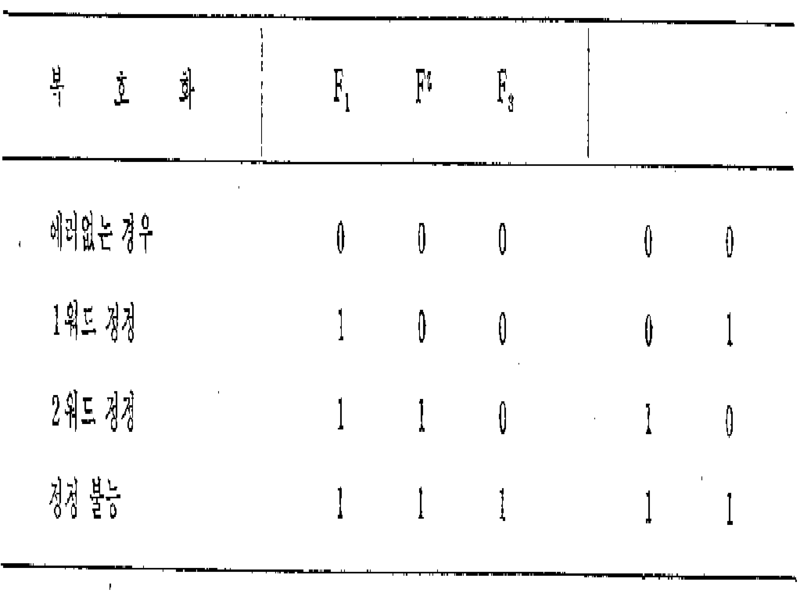 According to the gyeolhae of the present invention, the number of errors is detected in the second decoding of the double coded error correcting code, missing and error correction is only affected by the error correction methods when the smaller the probability of error correction according to the detection result, and to provide a unit. 본 발명의 또 다른 견해에 따르면, 에러의 확률이 높고 에러가 적을 때 이중 부호화된 에러 정정의 제2의 두번째 복호화에서 하나의 에러가 정정되며, 에러의 확율이 작은 에러는 순차적으로 검출되고, 소실에 대한 정정 횟수는 여러 검출 및 정정 능력을 증가시키기 위해서 제1의 복호화 결과 나타나는 플래그의 상태와 검출 능력 결과에 따라 증가되는 에러 정정 방법 및 장치를 마련하는 것이다. According to another viewpoint of the present invention, a high probability of error when the error is less that one error is corrected in the second decoding of the second of the double-encoding the error correction, the smaller the error probability of an error is detected in sequence, loss correction for the number of times is provided to an error correction method and apparatus which is increased in accordance with the decoding result of the state flag and the detectability of the results that appear first in order to increase the number of detection and correction capability. 본 발명의 또 다른 견해에 따르면, 이중 부호화된 리드 솔로몬 코드와 같은 에러 정정 코드는 디지탈 오디오 시스템의 디지탈 신호를 재생하는데 사용되며, 제1의 복호화와의 상태를 나타내는 플래그가 부가되며, 신호는 에러 워드의 위치와 에러 패턴을 결정하여 플래그를 사용하는 것에 의해 제2의 복호화에서 한번 이상 복호되며, 원하는 조건에 합당한 결과가 그 워드에 있는 에러를 정정하기 위하여 선택되는에러 정정 방법 및 장치를 마련하는 것이다. According to another viewpoint of the present invention, an error correction code such as a double-encoded Reed-Solomon code is used to reproduce the digital signal of the digital audio system, and a flag indicating the state of the decoding with the first portion, signal error and decoding one or more times in the decoding of the second by to determine the location and the error pattern of the word using a flag, which is a reasonable result in the desired condition provided an error correction method and apparatus that are selected so as to correct an error in that word will be. 본 발명의 개요는 다음과 같다. Summary of the invention are as follows. 제1의 복호화는 이중 부호화된 에러 정정 부호에 따르고, 복호 상태를 나타내는 플래그가 부가된다. Decoding of the first coding is following a double-error correction code, a flag indicating a decoding state is added. 제2의 복호화에서, 복호는 플래그를 사용하여 한번 이상 영향을 받으며, 최적 복호화 방법이 복호 결과에 따라 결정되며, 그 최적 복호화 방법에 의한 복호 결과에 따라 에러 정정이 행하여진다. In the decoding of the second decoding receives the at least one impact by using the flag, the optimum decoding method is determined according to the decoding result, the error correction is performed according to the decoding result by the optimum decoding method. 따라서 에러 검출 및 정정 능력은 향상된다. Therefore, error detection and correction capability is improved. 제2의 복호화 방법에 대한 선택 평가기준은 제1의 복호화에서 부가된 플래그 발생확률, 에러 검출의 실패의 확률, 제2의 복호화에서 코드 정정의 무능의 확률과 검출무능의 확률에 의해 결정되는 정정 및 검출능력에 대한 조건이나 절충에 의하여 결정된다. A second decoding method selected end point correction which is determined by the probability of the first flag the occurrence probability, the probability of the error detection fails, the inability of the second code correction in the decoding probability and the detection disabled portion in the decoding of the and it is determined by the conditions and the trade-off for detectability. 본 발명의 실시예 전에 본 발명의 이해를 쉽게하기 위하여 관련된 미국 출원번호 622,711의 발명을 간단히 설명한다. A brief description of the invention related to US Application Serial No. 622 711 In order to facilitate understanding of the present invention before an embodiment of the present invention. 관련된 발명은 본 발명 이전에는 공개되지 않았으며 종래의 기술로서 인용되지 않았다. Associated invention has not been published prior to the present invention has not been incorporated by the conventional technique. 본 명세서의 참고로서 삽입하였다. It was inserted by reference herein. 4의 범위에서 4의 정정이 가능하다(이하, 전자를 에러로 후자를 소실로 한다). It is in the range of 4 possible correction of 4 (hereinafter, the latter lost the electrons to an error). 따라서, C 1 복호화에서는 에러의 검출과 하나의 워드 정정을 행하며, 복호화 조건을 나타내는 플래그가 각각의 워드에 부가되고, C 2 복호화에서는 각 워드에 부가되는 플래그의 조건에 따라 다음의 세가지 복호화중 하나를 행하는 것에 의해 오차 교정의 능력을 높일 수가 있다. Therefore, in the C 1 decoding performs the error detection and single word correction, is added to each word flag indicating the decoding conditions, in the C 2 decoding one of three decoding in accordance with the condition of the flag which is added to each word by being carried out it can be increased the power of error correction. (1) S=2 E=0 : 2개까지의 오차를 정정. (1) S = 2 E = 0: correct an error of up to two. (2) S=1 E=2 : 하나의 정정과 2개의 소실을 정정. (2) S = 1 E = 2: Correct the single correction and two lost. (3) S=0 E=4 : 4개의 소실을 정정. (3) S = 0 E = 4: correct the four lost. 제2도는 C 1 복호화에 대한 순서도이다. 2 is a flow chart for turning the C 1 decoder. N(E)는 C 1 복호화에서 에러가 하나일때 검출된 에러의 수이고, 하나의 워드 정정이 수행된다. N (E) is the number of an error is when a detected error in the C 1 decoding, is performed one word corrected. F 0 플래그와 F 1 플래그는 C 1 복호화에서 복호화 상태를 나타내는 플래그로서 사용된다. Flag F 0 and F 1 flag is used as a flag to indicate a decoding state in the C 1 decoder. F 0 플래그는 에러가 검출되었을때 "1"로 세트되고, F 1 플래그는 둘 이상의 에러가 있어 정정을 할 수 없을 때 "1"로 세트된다. F 0 flag is set to "1" when an error is detected, 1 F flag is set to "1" when there is more than one error can not be corrected. 제3도는 C 2 복호화에 대한 순서도이다. 3 is a flow chart for turning the C 2 decoding. N(F 0 )는 F 0 플래그의 수를 N(F 1 )은 F 1 플래그의 수를 나타낸다. N (F 0) is the number of the flag F 0 N (F 1) is the number of the flag F 1. C 2 복호화에서 블럭의 플래그 수와 일치하는 에러 상태를 추측하여 최적의 복호화 방법을 결정하고 선택한다. From C 2 decoding assume an error status to match the number of the flag of the block to determine the optimum decoding method is selected. 예를들면 N(F 0 )=4일 때, 즉, F 0 플래그의 수(F 1 플래그가 부가되어 있는 것도 포함)가 4일 때, 플래그가 부가된 위치는 에러의 위치(에러의 위치를 알고 있는 에러)로서 추측하고 공식(3)으로 소실 정정을 한다. For example N (F 0) = is 4, that is, F number of zero flag (including those which F 1 flag is added) is 4 days time, where a flag is added is the position of the location of the error (error speculation errors as known), and the loss of the correction formula (3). 제4도는 하나의 C 2 블럭에 세개의 에러가 포함된 경우의 예를 나타낸다. 4 gives the example of a case that contains three errors in a C 2 block. (6)은 C 1 블럭을 나타내고, (7)은 C 2 블럭을, (8)은 플래그된 에러 워드를, (9)는 실제로 정정하는 플래그된 워드를 나타낸다. 6 denotes a C 1 block, (7) a C 2 block, 8 is an error flag of the word, (9) denotes a flag word to actually correct. 이는 단어(9)가 있는 C 1 블럭에서 에러가 있음을 나타낸다. This indicates that there is an error in the block C 1 with the word (9). C 1 복호화에서 에러가 검출되면, 블럭에 있는 모든 워드(심벌들)에 플래그가 부가된다. If an error is detected from the C 1 decoding, a flag is added to all words (symbols) in the block. 하나의 워드에 에러가 있을 때에는 C 1 복호화로 정정된다. When there is an error in one word is corrected by C 1 decoding. 둘 또는 그 이상의 워드에 오차가 있을 때에는, 맞는 워드와 에러 워드가 있으므로, 그에 따라 플래그된 맞는 워드와 플래그된 에러 워드가 있게 된다. When there are two or more errors in the word, since the word and an error word, so that a match flag and a flag word error word accordingly fit. 2, E=0)을 하면, 제4도처럼 3개 이상의 에러가 있을때 에러는 정정되지 않는다. When the 2, E = 0), the fourth column all over when the error is more than 3 errors are not corrected. 본 발명은 이러한 정정 능력의 한계를 개선하기 위한 해결책을 제시한 것이다. The present invention proposed solutions to improve the limitations of these correction capability. 본 발명의 1실시예는 제1도에 도시한 에러 정정 코드를 참고로하여 설명한다. 1 embodiment of the present invention will be described by the error correction code shown in FIG. 1 by reference. 상술한 바와같이, 제1도의 에러 정정 코드를 복호화하는 데에 있어서, 하나의 워 드에 러는 C 1 복호화서 정정되고, 2워드의 정정, 1워드의 정정과 2워드의 소실 정정, 또는 4워드의 소실 정정은 C 2 복호화에서 한다. According to, for decoding a first-degree error correction code as described above, in a war-de dollars is correct standing C 1 decoding, the correction of two words, loss of correction of a word correction and the second word in, or 4 disappearance of the correction word is in the C 2 decoding. C 1 복호화에서, 에러의 검출과 하나의 워드의 정정은 제2도와 같은 방법으로 이루어지고, 에러가 검출되면 F 0 플래그가 부가되고, 에러가 정정 불능이면, 각각의 워드에 F 1 플래그가 부가된다. In C 1 decoding, the error detection and single word correction is the second comprises the help same way, if an error is detected F 0 flag is added, if the error is uncorrectable, F 1 flag is added to each word do. C 2 복호화에 대한 순서도가 있는 제6도와 제9도를 참고로 C 2 복호화 과정을 설명하기로 한다. A sixth assist FIG. 9 with the flow chart for the C 2 decoding with reference to a description of C 2 decoding process. 제9도는 제6도에 도시한 본 발명의 에러 정정 방법을 상세히 나타낸 것이다. Ninth turn illustrates in detail the error correction method of the present invention shown in Figure 6. L(F 0 )와 L(F 1 )은 C 2 복호화와 F 0 로 플래그되거나 F 1 으로 플래그된 위치에 의해 검출된 에러 위치의 일치된 수이다. L (F 0) and L (F 1) is the number of C 2 F 0 and the decoding flag to or matching of the error location detected by the location flag to F 1. F는 정정 불능워드에 부가된 정정 불능 플래그이다. F is a correction failure flag is added to the uncorrectable words. F=1이면 C 2 블럭의 모든 워드가 플래그되고, F=F 0 이면 F 0 로 플래그된 워드만이 플래그된다. And F = 1 if all the words of the block C 2 flag is F = F 0 is the only word with the flag F 0 flag. F로 플래그된 워드에 대해서는 평균 보간법으로 재생시 에러가 은폐된다. The error is concealed when reproducing the average interpolation method for a flag F to a word. (1) 우선, S=2, E=0로 복호화를 행한다. (1) performs the first decoding is performed, S = 2, E = 0. 임의의 위치에서 2워드의 에러까지 검출할 수 있다. At an arbitrary position it can be detected by an error of two words. 에러의 수가 2개 이하이면, 잘못 정정의 확률은 블럭의 플래그수와 에러의 위치에 부가되는 플래그에 따라 결정되고, 그 확률이 작으면 정정을 실행된다. When the number of errors up to two, the probability of error correction is determined according to the flag which is added to the number of flags of the blocks and the error position, it is executed a correction if the probability is small. 잘못 정정의 확률이 높으면 에러는 정정할 수 없다. The high probability of error correction error can not be corrected. 예를 들면, 검출된 에러의 수가 하나(N(E)=1)일때, F 1 플래그가 검출된 에러 위치에 부가되었는지 검사한다. For example, checks whether the number of detected errors one (N (E) = 1) when, flag F 1 is added to the detected error position. 그것이부가되었다면 (L(F)=1), 복호화된 결과는 옳고 에러 정정이 실행된다. It results it has been added if (L (F) = 1), the error correction decoding is performed right. F 1 플래그가 부가되지 않았다면 (L(F)=0), F 1 플래그의 수를 검사한다. F 1 flag has not been added (L (F) = 0) , to check the number of the flag F 1. F 1 플래그의 수가 3이하(N(F 1 )=3)이면, 복호화된 결과는 옳고 에러 정정이 실행된다. When the number of the flag F 1 3 or less (N (F 1) = 3 ), the decoded result is that the error correction is performed right. F 1 플래그의 수가 3보다 크면(N(F)＞3), 잘못 정정할 확률이 높아서 정정을 실행할 수 없다. The number of the flag F 1 is larger than 3 (N (F)> 3 ), can not perform this correction is high probability of error correction. 복호화된 결과의 진위를 검사하는 플래그 수의 임계치는 L(F 1 )과 N(F 1 )의 다양한 값에 대한 잘못 정정의 확률을 미리 계산함으로써 결정된다. Threshold value of the flag to check the authenticity of the decrypted result is determined by a pre-calculated probability of error correction for different values of L (F 1) and N (F 1). 확률을 계산하는 방법은 히데끼 이마이와 야수지 나가사카의 "이중 부호화 시스템의 복호화 방법" Journal of Association of Electronics and Electrical Communication of JAPAN, Vol. How to calculate the probability Hideki Nagasaka forehead Iwaya resin "decoding method of dual coding system" Journal of Association of Electronics and Electrical Communication of JAPAN, Vol. J65-A, No. J65-A, No. 12, Page 1254-1261. 12, Page 1254-1261. December 1982와 야시로의 "리드-솔로몬 코드의 상호 삽입법에 관한 복호화 특성", (앞과 동일 잡지) J66-A, No. December 1982 with Yashiro, "lead-decoding characteristic of mutual interpolation of Solomon codes", (in front and the same magazine) J66-A, No. 3, pp. 3, pp. 284-285, March 1983에 기술되어 있다. The 284-285, March 1983 is described. 0일때 잘못 정정의 확률은 높다(여기에서 e는 실제의 에러수이다). 0 when the probability of error correction is high (where e is the actual number of errors). N(E)=1이고 하나의 워드의 에러가 정정되었을 때, 블럭에 4개 이상의 에러가 포함되어 있으면 잘못 정정이 발생한다. N (E) = 1, and when an error of one word correction, if it contains more than four errors in a block is generated the error correction. N(F 1 )＞3이면, 4개 이상의 에러가 포함될 확률은 더 높아지고, 제7도에 도시한 것과 같이 잘못 정정을 실행하게 된다. N (F 1) is> 3, the probability that more than four errors is higher, the seventh is incorrectly executing the correction as shown in Fig. 제7도에서, (90)은 잘못 정정에 의한 에러로서 맞는 심벌이나 워드가 결정되는 경우를 나타낸 것이다. In a seventh FIG, 90 shows the case where the symbols or words that match as an error by the error correction determined. (2) 3개 이상의 에러가 (1)에서 검출되고 F 0 플래그의 수가 3이면, F 0 플래그에 부가되어 있는 세워드중 두 개가 소실되고 S=1, E=2인 복호화가 실행된다. (2) If three or more errors are detected and the number of the flag F 0 3 (1), is lost two of the three words that are added to the dog flag F 0 and S = 1, E = 2 is the decoding runs. 플래그된 워드들에서만 에러가 검출되었을 경우에는 복호화 결과를 사용하여 정정을 실행한다. If only the flagged word is error is detected by using the decoded result to execute the correction. (3) 3개 이상의 에러가 (1)에서 검출되고 F 0 플래그의 수가 4이면, 4개의 플래그된 워드들은 소실되고 S=0과 E=4인 복호화가 실행되어 4개의 워드 정정이 이루어진다. 3 is detected and the number of the flag F 0 4 in the (1) three or more errors, the four flags are word is lost and the decoding of run S = 0 and E = 4 is made as four word correction. (4) 3개 이상의 에러가(1)에서 검출되고 F 0 플래그의 수가 5 이상이고 F 1 플래그의수가 3이면 F 1 플래그에 부가되어 있는 3개의 워드중 2개가 소실되고, S=1과 E=2인 복호화가 실행된다. (4) the number of three or more errors are detected in (1) F 0 flag is lost two of the three words is added to 5 or more and if the number of the F 1 flag 3 F 1 flag dog, S = 1 and E = 2 the decoding is carried out. F 1 으로 플래그된 워드들에서만 에러가 검출되면, 복호화된 결과를 사용하여 정정을 행한다. When the flag F 1 only in the word error is detected, by using the decoded result of the correction is carried out. (5) 2 내지 3개의 에러가 (1)에서 검출되고 (2)-(4)의 정정 조건에 맞지 않으면, 에러는 정정 불능이 된다. (5) 2 to 3 errors are detected in (1) (2) does not meet the conditions of correction (4), the error is uncorrectable. 서로 다른 복호화 방법으로 두번 복호화함으로써 복호화를 한번했을 경우 발생하는 정정 불능이나 잘못 정정된 에러를 바로 잡을 수 있다. If the decoding by the decoding once twice by different decoding methods may be corrected or an uncorrectable error correction error is caused. 예를들면, 제4도의 에는(3)의 방법으로 정정이 가능하고 제5도의 에는 (1)의 방법으로 바로 잡을 수 있다. For example, the four-degree is corrected by the method of (3) and can be corrected by the method of the fifth degree (1). N(F 0 )=0, 즉, 제8도에 도시한 바와같이 2개 이상의 플래그된 에러를 포함하고 플래그되지 않은 에러도 포함하는 경우에는(1)-(5)까지의 방법으로 에러는 정정 불능이다. N (F 0) = 0, i.e., if that also contains an error that does not include the error of two or more flags, and flags as shown in claim 8 also has (1) - (5) how the errors are corrected to the It is impossible. 그러한 경우에도 소실위치를 바꾸면서 복호화 횟수를 증가시키고 S=1과 E=2인 복호화를 실행함으로써, 3개의 에러까지는 정정이 된다. By such an increase in the number of times decoding while changing the position it lost even if the decoding and execution of S = 1 and E = 2, is corrected by the three errors. (1)-(5)에서 복호화가 두번 실행되는 동안, 동시에 서로 다른 복호화를 할 수 있고, 복호화를 수행한 후에 최적의 복호화 방법의 결정 할 수 있고, 최적 복호화 방법에 의한 복호화 결과를 사용하여 에러 정정을 할 수 있다. (1) - (5) in while the decoding is executed twice, at the same time it is possible to determine the optimum decoding method after one another and to the other decoding, performs decoding using the decoding result by the optimum decoding method the error It can be corrected. 제9도에 도시한 바와같이, C 1 복호화에 기부된 F 1 플래그와 F 0 플래그를 사용하여 복호화 결과를 검사할 수 있으므로, 잘못 정정의 확률이 낮아지고 에러 검출과 정정 능력을 개선하여 훨씬 효율적으로 에러를 정정할 수 있다. As shown in FIG. 9, using the F 1 flag and F 0 flag contributed by C 1 decoding it is possible to check the decoding result, to lower the probability of the error correction more efficient by improving the error detection and correction capability as it can correct the error. 제10도는 동시에 실행되는 2개의 다른 C 2 복호화의 순서도이다. Claim 10 degrees 2 is a flow chart of one another C 2 decoding to be executed at the same time. "복호화 1"에서는 S=2와 E=0인 복호화(1)이 실행되고, 검출된 에러의 수가 2개 이하이면 복호화 결과를 사용하여 정정이 되고, 2개 이상이면 정정을 할 수 없다. "Decrypted 1" can not make the correction if S = 2 and E = 0 is decoded (1) is running, the number of detected errors to be corrected by using the decoding result is less than two, or more than two. 이 경우, CS는 "1"로 세트된다. In this case, CS is set to "1". "복호화 2"에서는, S=1과 E=2인 복호화(2) 또는 S=0과 E=4인 복호화(3)이 실행되고, CS=1이면 복호화 결과를 사용하여 정정을 할 수 있다. The "decoding 2" can be the S = 1 and E = 2, the decoding (2), or S = 0 and E = 4 is decoded (3) is running, the correction using the decoding result when CS = 1. 제10도의 방법에서, 동시에 실행하는 2개의 다른 복호화 회로를 사용하는 복호기 2개를 써야 하지만, 복호화 시간은 단축할 수 있다. In a 10-degree method, to write two dogs using two different decoding circuits running at the same time, but the decoder, the decoding time can be shortened. 제11도는 제10도의 방법에 따른 에러를 정정하기 위한 에러 정정 장치의 1실시에이다. Claim 1 is performed in the error correction apparatus for correcting errors in accordance with claim 10 degrees 11 degrees method. (100)과 (101)은 14제도에 상세히 도시한 에러 정정 회로를 나타낸 것이다. 100 and 101 shows a detail illustrating an error correction circuit 14 to the system. 회로(100)은 "복호화 1"의 복호화를 실행하고, 회로(101)은 "복호화 2"의 복호화를 실행한다. Circuit 100 and circuit 101 performs decryption of the "decrypted 1" and executes the decoding of the "decoded second". (102)는 입출력 제어회로, (103)은 래지스터, (104)는 입력버퍼, (105)는 출력버퍼, (106)은 AND회로를, 그리고 (107)은 인버터(inverter)를 나타낸다. 102 input-output control circuit 103 is below the register, 104 is an input buffer, 105 is an output buffer, 106 is an AND circuit, and 107 denotes an inverter (inverter). 에러 정정 회로(100)과 (101)에 수신 신호가 동시에 가해진다. An error correction circuit 100 and 101, the received signal is applied at the same time. "복호화 1"과 "복호화 2"의 복호화는 나란히 실행된다. The "decoded first" and "second decoding" the decoding side is performed. "복호화 1"에서 검출된 에러의 수가 2개 이하이면, 레지스터(103)에 "0"이 로드(load)되고, 에러의 수가 2개 이상이면 레지스터(103)에 "1"이 로드된다. If the "decoded first" number of detected errors in more than two, and "0", the load (load) to the register 103, the number of errors is more than one "1" is loaded into the register 103. 레지스터(103)의 내용이 "0"이 될때, 에러 정정 회로(100)의 출력 버퍼는 에러 정정 모드로 선택되고, "복호화 1"의 결과에 따라 에러가 정정되거나 정정 불능 플래그가 세트된다. When this content of the register 103 is "0", the output buffers of the error correction circuit 100 is selected as the error correction mode, an error is corrected or the correction failure flag is set according to the results of the "decoded first." 본 발명의 에러 정정 방법은 또한 제1도에 도시한 것 이외의 다른 이중 부호화된 에러 정정 코드에도 적용할 수 있다. Error correction method of the present invention can also be applied to other dual-encoded error correction codes other than those shown in the first FIG. 제12도와 제13도는 본 발명의 에러 정정 방법의 또 다른 실시예를 나타낸 것이다. No. 12 shows the help of claim 13 to turn another of the error correction method of the present invention embodiment. (11)은 정보 워드, (12)는 제1의 검사워드, (13)은 제2의 검사워드를 나타낸다. 11 are information words, 12 check word, 13 of the first represents the check word of the second. 부호화는 즉, 24개의 정보워드 W i 0 ~W i23 (i=0~29)에 대하여 제1의 검사 워드 W io ~W i7 를 부가하여 C 2 블럭(15)를 형성한다. Encoding that is, to form the 24 information words W i 0 ~ W i23 (i = 0 ~ 29) C 2 block 15 in addition to the test word W io ~ i7 W of the first with respect to the. 그 다음 제2의 검사워드 P 0j ~W 29j (j=0~23)는 30개의 정보 워드 W 0j ~W 29j (j=0~23) 또는 30개의 제1의 검사워드 Q 0k ~Q 29k (k=0~7)를 부가하여 C 1 블럭(14)를 형성한다. The check word P in the following claim 2 0j ~ W 29j (j = 0 ~ 23) has 30 information words W 0j ~ W 29j (j = 0 ~ 23) or 30 of first check words Q 0k of ~ Q 29k ( adding a k = 0 ~ 7) to form a C 1 block 14. 복호화는, C 1 블럭에서 에러의 검출과 정정이 실행된 후 C 2 블럭에서 에러의 검출과 정정이 수행된다. Decoding, detection and correction of errors in the block C 2 is performed after the detection and correction of errors in the block C 1 is running. C 1 블럭은 코드 길이 32, 2개의 검사 워드, 해밍 거리 3을 갖는 리드 솔로몬 코드를 사용한다. C 1 block uses a Reed-Solomon code having a code length of 32, and two check words, the Hamming distance three. 따라서, 1워드 에러 정정이 가능하고 C 1 의 복호화는 제2도에 도시한 것과 동일하게 된다. Accordingly, the decoding of the first word error correction possible and C 1 is the same as that shown in FIG. 2. C 2 블럭은 코드 길이 32, 8개의 검사워드 해밍 거리 9를 갖는 리드 솔로몬 코드를 사용한다. C 2 block uses a Reed-Solomon code having a code length of 32, eight check word Hamming distance. 9. 8의 범위내에서 오차를 정정할 수가 있다. 8, it is possible to correct an error in the range of. C 2 복호화 과정은 제10도에 도시한 순서도에 따라서 설명한다. C 2 decoding process will be described with reference to the flow chart illustrated in FIG. 10. (1) S=4와 E=0으로 복호화를 행하므로 4개의 에러 워드 위치까지를 검출할 수 있다. (1) to the decoded S = 4, and E = 0, so it is possible to detect up to 4 errors word location. 검출된 에러의 수가 3개 이하이거나, 에러의 수가 4개이고 잘못 정정할 확률이 낮을 경우에는, 3개나 4개의 에러 워드가 정정된다. Is below the number 3 of the detected error, if the number of errors lower the probability of error correction four, three or four are corrected error word. (2) (1)에서 검출된 에러의 수가 5개 이상이고 F 0 플래그의 수가 4개인 경우, F 0 로 플래그된 4개의 워드가 소실되고, S=2와 E=4인 복호화가 실행된다. (2) (1) When the number of the number of detected errors of five or more, and F 0 flag in four, the four word flag to F 0 are lost, is executed S = 2 and E = 4 is decoded. 검출된 에러의 수가 2개이면 4개에서 6개까지의 에러 워드가 정정된다. If the number 2 of the detected error is an error word in the 4 to 6 are corrected. (3) (1)에서 검출된 에러의 수가 5개 이상이고 F 0 플래그의 수가 5개이면, F 0 로 플래그된 5개의 워드가 소실되고, 검출된 에러의 수가 1개 이하이면 5개에서 6개까지의 에러 워드가 정정된다. (3) (1) number of detected errors in more than five, and if the number of sets of five F 0 flag, the five words of a F 0 flag is lost, the number of detected errors is less than one in five 6 an error word is corrected to the dog. (4) (1)에서 검출된 에러의 수가 5개 이상이고 F 0 플래그의 수가 6개이면, F 0 로 플래그된 5개의 워드가 소실되고, S=1과 E=6인 복호화가 실행된다. (4) (1) number of detected errors in more than five, and if the number six of the F 0 flag, the five words of a F 0 flag is lost, is executed S = 1 and E = 6 is decoded. 검출된 에러의 수가 1개 이하이면 6개 내지 7개의 에러 워드가 정정된다. When the number of detected errors is less than one of 6 to 7 error word is corrected. (5) (1)에서 검출된 에러의 수가 5개 이상이고 F 0 플래그의 수가 7개이면, F 0 로 플래그된 6개의 워드가 소실되고 S=1과 E=6인 복호화가 실행된다. (5) (1) When the number of the number of five or more, and the flag F 0 of the detected errors in the seven, six word is lost the flag F to 0, and the execution of S = 1 and E = 6 decoding. 플래그된 워드들 사이에서만 에러가 발생하면, 6개 내지 7개의 에러 워드가 정정된다. If only an error occurs between a flag word, a six to seven error word is corrected. (6) (1)에서 검출된 에러의 수가 5개 이상이고 F 0 플래그의 수가 8개이면, F 0 로 플래그된 8개의 워드가 소실되고 S=0와 S=8인 복호화가 실행되어 8개의 에러 워드가 정정된다. 6 (1) it is when the number eight of the number of detected errors of five or more, and F 0 flag, the eight word flag to F 0 lost and is in S = 0 and S = 8 decoding run on 8 an error word is corrected. (7) (1)~(6)까지의 정정 조건에 해당하지 않는 경우, 에러는 정정불능이다(F=1, F=F 0 ). 7 (1) - If this is not the correct condition to 6, the error is uncorrectable (F = 1, F = F 0). 본 발명의 에러 정정 방법을 사용한 에러 정정 장치에 대해서 제14도에 의해 설명한다. For error correction apparatus using the error correction method of the present invention will be described by claim 14 degrees. 제14도는 에러 정정 장치의 블럭도이다. 14 is a block diagram of an error correction device leads. (17)-(16)는 버스라인, (20)은 신드롬(syndrom)발생기, (21)과 (22)는 ROM, (24)는 논리 연산부, (25), (27) 및 (29)는 RAM, (26)은 계수기, (28)은 비교기, (30)은 점프(jump)조건 판단 회로, (31)은 프로그램 ROM, (32)는 어드레스 계수기를 나타낸다. 17 - 16 is a bus line, 20 is a syndrome (syndrom) generators, 21 and 22 has ROM (24) is a logical operation unit, 25, 27 and 29 RAM, (26) is a counter, 28 is a comparator, 30 is the jump (jump) condition decision circuit, 31 is a program ROM (32) represents the address counter. 본 회로는 3개의 버스라인, 버스라인에 연결된 회로와 프로그램에 의해 회로의 동작을 제어하는 제어회로로 구성된다. The circuit consists of a control circuit for controlling the operation of the circuit by the circuit and program are connected to the three bus lines, the bus lines. 버스라인(17)은 수신된 신호와 에러 패턴(pattern) 등의 데이타를 교환하기 위한 데이타 버스, 버스라인(18)은 데이타 위치등의 데이타를 교환하기 위한 위치(location)버스, 버스라인(19)는 데이타에 부가되는 플래그 데이타를 교환하는 플래그 버스이다. Bus line 17 is the received signal and error pattern (pattern) data bus, the bus lines 18 to exchange data, such as the position (location), bus line for exchanging data, such as data location (19 ) is a flag bus that exchange flag data added to the data. 데이타 입출력 단자(38), 어드레스 입출력 단자(39), 플래그 입출력 단자(40)은 각각의 버스에 연결되어 있다. Data input and output terminal 38, an address output terminal 39, a flag input and output terminals 40 are connected to the respective buses. 신드롬 발생기(20)은 데이타 입출력 단자(38)에 수신된 신호로 신드롬을 발생한다. Syndrome generator 20 generates the syndrome as a received signal to a data input-output terminal (38). 논리연산부(24)는 신드롬 발생기에서 나온 신드롬에 의해 에러 위치와 에러 패턴을 결정한다. A logical operation unit 24 determines the error position and error pattern by the syndrome from the syndrome generator. 연산논리부(24)는 갈로이스(Galois)필드(2 8 )에서 곱셈 나눗셈 그리고 덧셈을 실행한다. Arithmetic logic unit 24 executes the multiplication and addition and division in the go-Royce (Galois) field (2 8). RAM(25)는 신드롬과 연산논리부(24)의 연산결과를 기억한다. RAM (25) stores the operation result of the syndrome calculation and logic unit 24. (23)은 데이타 버스(17)에 있는 데이타가 0인지 아닌지를 결정하는8입력 OR회로를 표시한다. 23 has a display 8-input OR circuit that determines whether or not the data is zero in the data bus 17. ROM(21)과 (22)는 데이타 버스17(i와 α)과 위치 버스(18)의 데이타를 변환한다. ROM (21) and (22) converts the data from the data bus 17 (i and α) and the nearest bus (18). 데이타버스상에서 데이타는 벡버로 표시되고, 위치 버스상에서 데이타는 거듭 제곱 형태로 표시된다. Data on the data bus is indicated by bekbeo, located on the bus data is repeatedly displayed in the square form. 따라서 데이타를 데이타버스(17)과 위치버스(18)사이에서 교환하고자 할때, 데이타는 ROM(21)이나 (22)에 의해 i에서 또는 α i 에서 i로 변환을 행할 필요가 있다. Therefore, when trying to exchange data between data bus 17 and the nearest bus 18, data has in the ROM (21) or (22) from i by α i or necessary to convert i. 계수기(26)은 1개의 블럭내에 있는 플래그의 수를 계수한다. Counter 26 counts the number of flags in the one block. 제2의 복호화에서, 계수기(26)은 F 0 와 F 1 의 수를 계수하고, 그 수를 비교기(28)에 의해서 소정의 수와 비교하고 어떤 워드의 정정을 행하는가, 또는 정정을 행하는가 정정을 행하지 않는 정정 불능으로 하는가 등의 판단을 행한다. A second decoding on the, counter 26 is the correct haenghaneunga a comparison of the number of predetermined and haenghaneunga the correction of any word, or corrected by the counting the number of F 0 and F 1, and the number of the comparator 28 of the Should the correction failure is not performed it is determined, such as. RAM(27)은 계수기(26)에 의해 계수된 플래그의 수와 에러의 위치를 기억한다. RAM (27) stores the location of the number and the error flag of the coefficient by the counter 26. 비교기(28)은 위에서 설명한 바와 같이 소정의 수와 플래그의 수를 비교하고 복호화 과정에서의 데이타와 상수의 비교로 사용된다. Comparator 28 is compared to the number of the predetermined number of the flag, as described above, and used to compare the data with a constant in the decoding process. RAM(29)는 제2의 복호화에 있어서 데이타에 부가되어 있는 제1의 복호화의 결과를 나타내는 플래그 F 0 , F 1 을 기억한다. RAM (29) stores a flag F 0, F 1 represents the decoding results of the first, which is added to the data in the decoding of the second. RAM(29)에 기억되어 있는 플래그의 상태는 복호화로 결정된 에러 위치에서 플래그의 유무를 검사할때 사용된다. State of the flag stored in the RAM (29) is used to check the presence or absence of the error flag in the location determined by the decoded. 점프조건 판단회로(30)은 프로그램의 분기(branch)가 OR회로(23)과 비교기(28)에 의해 결정된 결과와 RAM(29)에 기억되어 있는 플래그 상태에 따라서 실행될 것인지를 결정한다. Jump condition determination circuit 30 determines whether the flag is executed according to the state in which the branch (branch) of a program stored in the RAM and the result (29) as determined by the OR circuit 23 and the comparator 28. 프로그램ROM(31)은 복호화를 실행하는 상기 회로를 제어하는 프로그램을 기억한다. Program ROM (31) stores the program for controlling the circuit that performs decryption. (33)은 버스라인과 비교기에 입력되는 상수와 RAM 어드레스를 결정하는 명령 신호를 표시한다. 33 represents a command signal for determining the constants and the RAM address to be input to the bus line and a comparator. (34)는 프로그램 분기의 조건을 결정하는 명령신호를 나타낸다. 34 shows a command signal for determining the conditions of the program branch. 점프조건 판단회로(30)에서는 신호(34)의 내용과 OR회로(23), 비교기(28), RAM(29) 등의 상황을 비교하여 분기를 행하는가 아닌가를 결정한다. In a jump condition determination circuit 30 determines whether or not the information haenghaneunga and OR circuit 23, a comparator 28, a quarter compared to the situation, such as RAM (29) of the signal (34). (35)는 분기하는 경우 분기 어드레스를 결정하기 위한 명령 신호이고, (36)은 버스 라인에 연결되어 있는 버퍼와 레지스터를 제어하기 위한 신호를 표시한다. 35 if the branch instruction is a signal for determining a branch address, 36 denotes a signal for controlling the buffer and the register that is connected to the bus line. 계수기(32)는 프로그램 어드레스를 제어한다. Counter 32 controls the program address. 계수기(32)는 주 클럭 입력(41)로부터 공급되는 클럭에 의해 프로그램ROM(31)의 어드레스를 진행하여 프로그램을 실행되도록 한다. Counter 32 is such that to a clock supplied from the primary clock input (41) proceed to the address of the program ROM (31) to execute the program. 프로그램이 분기될때, 어드레스(35)로의 분기는 분기명령(37)에 의해 계수기(32)에 로드하여 프로그램을 분기시킨다. When the program is branched, the branch to the address 35 is loaded in the counter 32 by the branch instruction 37, then the program branches. 입력단자(42)는 프로그램이 시작될때 계수기(32)를 리세트하는 신호를 입력하는 것이다. Input terminal 42 is to input a signal for resetting the counter 32 when the program is started. 상술한 바와같이, 본 실시예의 에러 정정 장치에 따르면, 회로는 프로그램에 의하여 제어되며, 제15도와 제16도의 실시예에 유사하게 적용될 수 있다. As described above, according to the error correction device of this embodiment, the circuit is controlled by a program, the 15 degrees and can be similarly applied to the embodiment of claim 16 degrees. 따라서, 회로의 크기는 작아질 수 있으며, 다른 에러 정정 코드의 복호화는 단지 프로그램을 변경만으로 할 수 있다. Thus, the size of the circuit can be made small, decoding the other error correction code can only be changed only by the program. 제15도와 제16도는 디지탈 오디오 디스크에 사용된 상호 삽입 리드 솔로몬 코드(영국 특허명세서 GB 2076569A)에 적용된 본 발명의 실시예를 나타낸 것이다. Claim 15 degrees and shows an embodiment of the present invention is applied claim 16 degrees to the mutual insertion Reed-Solomon code (United Kingdom patent specification GB 2076569A) used for digital audio discs. 이 코드는 C 1 블럭에 대하여 리드 솔로몬 코드를 사용하는데, 코드 길이는 32, 검사어의 수는 4, 해밍 거리는 5이고, C 2 블럭에 대한 리드 솔로몬 코드는 코드 길이가 28, 검사어의 수는 4, 해밍 거리는 5이다. This code uses a Reed-Solomon code with respect to the C 1 block, code length is 32, the number of the check word is four, the Reed-Solomon code for a Hamming distance 5, C 2 block code length is the number of 28, test control is 4, the Hamming distance 5. 상호 삽입 리드 솔로몬 코드의 복호 회로는 재생신호 입력단, C 1 복호기, 제거회로, C 2 복호기와 출력신호단으로 구성한다. Decoding circuit of the mutual insertion Reed-Solomon code constitutes a reproduction signal input terminal, C 1 decoder, eliminating circuit, and an output signal C 2 decoder only. 복호화에서, 32워드 재생신호는 C 1 복호화된 것이다. In the decoding, the reproduction signal 32 words is the C 1 decoder. C 1 복호화한 후에 24-워드 정보와 C 2 검사워드는 제거되고, 복호 결과로서 24워드 정보를 만들기 위하여 C 2 -복호화된다. After 24-C 1 decoded information word and a check word C 2 are removed, C 2 to make a 24-word information as a decoding result - is decoded. 제15도는 C 1 복호화의 순서도이다. 15 is a flow chart of the turn C 1 decoding. 상술한 바와같이, C 1 코드는 최소거리 5를 갖는 리드 솔로몬 코드를 사용한다. As described above, C 1 code uses a Reed-Solomon code having the minimum distance 5. 따라서 1워드 또는 2워드 에러 정정이 될 수 있다. Thus be the first word or the second word error correction. C 1 복호화에서, 3 또는 그 이상의 에러 워드 때문에 에러가 없거나, 1워드 정정,2워드 정정 혹은 정정 불능 에러가 생길 수 있다. In C 1 decoding, or an error due to three or more error words, there may be a first word correction, two word correction or uncorrectable error. 표1에 도시한 3개의 플래그 F 0 , F 1 , F 2 는 4가지 형태를 나타내는 플래그로서 C 1 블럭상에 워드로 부가된다. Shown in Table 1, the three flag F 0, F 1, F 2 is added as a flag indicating the four types with a word in the block C 1. 실제로 C 1 플래그 정보는 블럭당 2-비트정보로서 다루어질 수 있다. In fact, C 1 flag information may be treated as 2-bit information per block. 4의 범위내에서 행하여진다. It is carried out in the range of 4. 복호화(1) : 2워드 에러 정정. Decoding (1): 2 word error correction. 복호화(2) : 2워드 소실+1워드 정정. Decoding (2): 2 word disappearance +1 word correction. 복호화(3) : 4워드 소실 정정. Decoding 3: 4 words loss correction. 에러 정정 능력을 증가시키기 위하여 복호화(2)와 복호화(3)에 의하여 많은 에러를 정정하는 것이 필요하다. To increase the error correction capacity to correct the number of errors by decoding (2) and decoding (3) in order is required. 그러나, 소실 정정은 검출 능력이 낮으며, 정정 능력이 선택된 소실에 따라서 감쇄된다. However, the loss of correction were detected capacity is low, the correction ability is attenuated in accordance with the selected chamber. 에러 정정 능력과 검출 능력을 증가시키기 위하여 복호화(2) 또는 복호화(3)이 잘못 정정 확율이 낮을 때에만 영향을 받도록 복호화 알고리즘(algorithm)이 사용될 수 있다. Error correction decoding in order to increase the capacity and detectability (2) or decoding (3) may only be affected be the decryption algorithm (algorithm) when low error correction probability. C 2 복호화를 위한 특수 알고리즘은 제16도를 참고로하여 설명한다. Special algorithms for decoding C 2 will be described with the claim 16, also by reference. (1). (One). S=2이고 E=0인 복호화가 첫번째로 실행된다. And S = 2 is the decoded E = 0 is executed first. 그래서, 임의 위치에서 2워드 에러까지 검출될 수 있다. Thus, it can be detected at any location up to two word errors. 검출된 에러의 수가 2 이하일 때, 블럭에서 플래그 수와 에러위치에 부가된 플래그의 존재 유무의 판단에 따라 잘못 정정의 확율이 낯을 때 정정이 된다. When the number of detected errors is less than 2, and the correction when the probability of error correction according to the face determination in the presence of a flag in addition to the block number flag and the error position or not. 잘못 정정의 확율이 높으면, 에러는 정정할 수 없다. The higher the probability of the error correction, the error can not be corrected. (2). (2). (1)에서 검출된 에러의 수가 3이상이고 F 1 플래그의 수가 3개이라면, 2 또는 3개의 F 0 로 플래그로된 워드들이 소실되고 S=1이고 E=2인 복호화가 실행된다. (1) it has at least three of the detected errors in the number and if three of the flags F 1, to the loss of a flag to two or three word F 0 and is S = 1 and E = 2, the decoding is executed. 단지 플래그된 워드들에서 에러가 검출된다면, 복호화 결과를 사용하여 정정이 된다. If an error is detected in the only flag word, by using the decoding result is a correction. (3). 3. (1)에서 검출된 에러의 수가 3개이상이고, F 1 플래그의 수가 3개 이상이면 F 2 플래그의 수가 2 또는 3개라면, 2개의 F 2 로 플래그된 워드가 소실되고, S=1이고 E=2인 복호화가 실행된다. And the number of errors detected in the (1) more than three, the number of F 1 flag is three or more, if the number of two or three of F 2 flag, is lost the flag word in the two F 2, and S = 1 is the decoding is performed E = 2. 만일 F 1 으로 플래그된 워드에서만 에러가 검출된다면, 복호화 결과를 사용하여 정정이 된다. If an error is detected only in a flag word to ten thousand and one F 1, it is a correction using the decoding result. (4). (4). (1)에서 검출된 에러의 수가 3개 이상이고 정정조건(2)나 (3)이 맞지 않는다면, 에러는 정정 불능이다. If the number of three or more of the error detection in (1) and the correction condition (2) or (3) is not met, the error is uncorrectable. 제17도는 제15도와 제16도에 도시한 본 발명의 실시예와 종래의 장치에서의 에러 정정 능력과 에러 검출 능력의 비교를 도시한 것이다. 17 degrees shows a comparison of error correction capability and the error detection capabilities of a in the embodiment and the conventional apparatus of the present invention illustrated in Figure 16 to help claim 15. 제17도에서, 가로축은 워드 에러비율이고, 세로축은 에러 정정후의 에러 확율을 나타낸다. In Figure 17, the horizontal axis is the word error rate, and the vertical axis indicates the error probability after error correction. 곡선Ⅰ는 사코(Sako) 등에 의하여 미국 특허 443785에서 공개된 종래의 장치에서의 교정 능력과 검출 능력을 나타낸다. Ⅰ curve represents the calibration capabilities and detectability in the published prior art device in US patent 443 785 or the like by Sako (Sako). 이 정정 방법에서는, 단지 하나의 플래그(포인터(pointer)코드 신호)가 제1의 C 1 복호화에서의 각 워드 신호에 부가되고, 2개의 에러가 다음의 C 2 복호화에서 정정될 수 있다. In this correction method, there is only one flag (a pointer (pointer) code signal) is added to each word signal in the 1 C 1 decoding of, two errors can be corrected in the following C 2 decoding. 곡선 Ⅱ는 위와 관련된 출원에서 공개된 정정 방법에 의한 정정 능력과 검출 능력을 나타낸다. Ⅱ curve represents a correction capability and detectability by the correction method disclosed in the above related applications. 이 방법에서, C 2 복호화는 3개의 복호화, 즉 에러 정정, 에러 및 소실 정정과 소실 정정에 의한 정정 과정을 사용한다. In this method, C 2 decoding uses the correction process by the three decoded, i.e. an error correction, error correction and loss and loss correction. 곡선Ⅲ은 본 발명의 실시예에 대한 정정 능력과 검출 능력을 나타낸다. Ⅲ curve represents the correction capacity and the detection capabilities of the embodiments of the present invention. 위와 관련된 출원의 정정 과정은 정정 능력을 향상시키기 위하여 더욱 개선이 된다. Above and associated correction process of the application is a further improvement to enhance the correction capability. 제17도의 특성 곡선에서, 검출 능력은 실제적으로 Ⅰ-Ⅲ의 각 경우와 동일하다. In the characteristic 17-degree curve, the detection capacity is practically the same as in each case the Ⅰ-Ⅲ. 반면에, 워드 에러 비율이 10 -3 에서의 특성 곡선 Ⅱ의 정정 능력은 특성 곡선 Ⅰ의 정정 능력보다 2차수가 높으며, 특성 곡선 Ⅲ의 정정 능력은 특성 곡선 Ⅰ의 능력보다 4차수가 높다. On the other hand, the characteristics of correction performance curve Ⅱ in the 10 -3 word error rate is higher than the second order correction capacity of the characteristic curve Ⅰ, Ⅲ correction capacity of the characteristic curve is higher than the fourth order power of the characteristic curve Ⅰ.
d 1 -1을 만족하는 S 2 워드 에러와 E워드 소실을 정정하는 것에서, S 2 는 위치를 모르는 워드 에러의 수이고 E는 소실된 수이며, 여러개의 S 2 와 E의 조합에 대하여 에러의 위치와 패턴을 결정하며, 여러개의 결정된 에러의 위치와 에러 패턴에 따라 정정의 고능력과 잘못 정정의 저확률을 갖는 S 2 와 E의 조합을 결정하고, S 2 와 E의 선택된 조합의 에러 위치와 에러 패턴에 따라 제2의 복호화 단에서 워드에러를 정정하는 공정을 포함하는 에러 정정방법. the d 1 from -1 for correcting S 2 words errors and E word disappearance satisfying, S 2 is the number of word errors do not know where E is the number of lost, the error with respect to the combination of a number of S 2 and E and determining the position and pattern, determine S 2 and E, the combination of having a low probability of correcting the high-capacity and error correction based on the location and the error pattern of a number of the determined error and, S error of the selected combination of the second and the E position and an error correction method in accordance with the error pattern comprises a step of correcting the word errors in the second decoding stages. d 2 -1에서, S 1 워드에 대한 에러 검출과 에러 정정을 포함하는 에러 정정 방법. in d 2 -1, the error correction methods, including error detection and error correction for the S 1 words. d 1 -1을 만족하는 S 2 와 E의 여러개의 조합에 대하여 병렬로 또는 순차적으로 결정하는 에러 정정 방법. error correction method for determining in parallel or sequentially with respect to a number of combinations of S 2 and E satisfying the d 1 -1. (정정) 특허청구의 범위 제1항에 있어서, 상기 코드 워드는 이중 부호화된 리드 솔로몬 코드인 에러 정정 방법. (Corrected) according to claim 1, wherein the scope of claims, the error correction method wherein a code word is encoded Reed-Solomon code, a double. (정정) 특허청구의 범위 제1항에 있어서, 상기 코드 워드는 이중 부호화된 주기적 중복 검사 코드인 에러 정정 방법. (Corrected) according to claim 1, wherein the scope of claims, the error correction method wherein the code word is a cyclic redundancy check code, a double encoding. (정정) 특허청구의 범위 제1항에 있어서, 단일 블럭에서 플래그의 수와 복호화 결과에 의하여 결정된 잘못 정정의 최소 확률을 갖는 S 2 와 E으이 조합의 복호 결과가 에러 위치와 에러 패턴에 대한 여러개의 복호 결과로부터 선택되고, 워드 에러는 선택된 복호 결과에 따라 정정되는 에러 정정 방법. (Corrected) according to claim 1, wherein the scope of the claims, the decoding result of S 2 and E euyi combination with the lowest probability of error correction is determined by the number of the flag and the decoding result in a single block several of the error position and error pattern is selected from the decoding result, the word error is an error correction method that is corrected in accordance with the selected decoding result. (정정) 특허청구의 범위 제1항에 따른 에러 정정 방법에 있어서, 입력 신호로부터 신드롬을 발생하기 위한 신드롬 발생기, 갈로이스 필드에서 덧셈, 나눗셈과 곱셈을 실행하기 위한 논리 연산부, 갈로이스 영역의 임의 차원 αi에서 αi를 i 또는 i를 αi로 변환하기 위한 변환회로, 입력 워드에 부가되는 여러개의 형태의 플래그를 계수하기 위한 계수기, 상기 신드롬 발생기에 의하여 발생된 신드롬, 상기 논리연산부의 결과, 상기 변환회로의 변환결과, 상기 계수기에 의해 계수되는 플래그된 입력 워드의 플래그의 수와 상기 입력 신호에 부가된 플래그들을 기억하기 위한 기억 회로. (Correct) any of the claims Royce extent claim according to the error correction method according to 1, wherein the logic for executing the syndrome generator, addition, division and multiplication, in Royce field go for generating a syndrome from the input operation section, to go in dimension for the αi i or i conversion for converting αi circuit at αi, the syndrome generated by the counter, the syndrome generator for counting a number of forms of the flag to be added to the entered word, the result of the logical operation section, the conversion conversion result of the circuit, a memory for storing a flag in addition to the number of the flag and the input flag signal of the input words to be counted by the counter circuit. 논리 연산회로, 상기 변환회로, 상기 기억회로를 제어하여 에러 정정 동작을 행하는 프로그램을 저장하기 위한 프로그램 기억회로와, 상기 프로그램과 플래그의 상태에 따라 상기 프로그램 기억회로의 어드레스를 제어하기 위한 제어회로를 포함하는 에러 정정 장치. A logical operation circuit, the converter circuit, a control circuit for controlling an address of said program memory circuit in accordance with a program memory circuit for storing a program for performing the error correction operation by controlling the memory circuit, the state of the program and the flag an error correction device including. AT78383T (en) * 1985-05-21 1992-08-15 Sony Corp Apparatus for decoding error-correcting codes.